Don't Fear the Haggis! 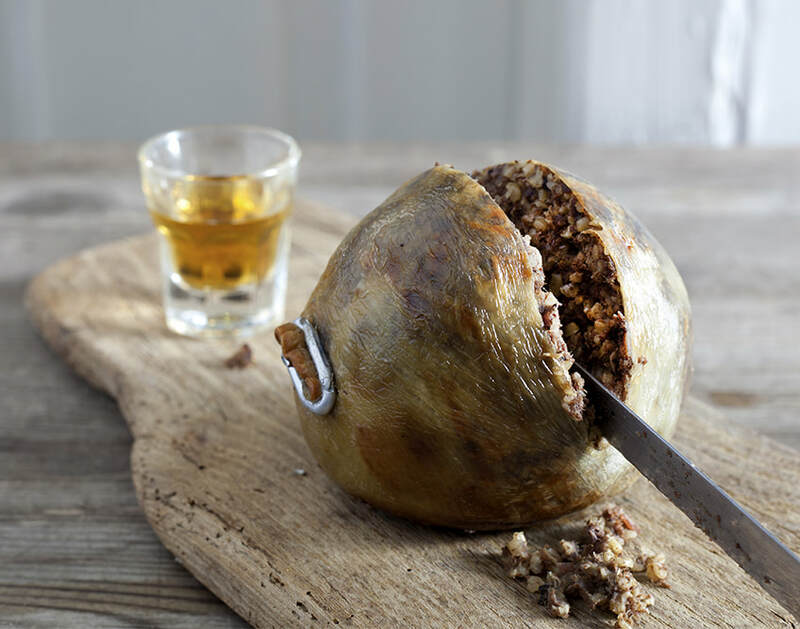 Haggis, a traditional Scottish delicacy, is a savory pudding containing sheep's pluck (you don’t really want to know), minced with onion, oatmeal, suet, spices and salt, mixed with stock. It is traditionally encased in the animal's stomach and simmered for a few hours. Most modern, commercial haggis is prepared in a sausage casing rather than an actual stomach. For the curious among you, here is a recipe for haggis that you can prepare for the holidays or other special occasion. This recipe appeared in The Highlander magazine a number of years ago and was taken from Ena Baxter’s Scottish Cookbook, one of the better Scottish cookbooks. To make haggis, you need the stomach bag of a sheep. Wash it well in cold water. Turn it outside in, scald and scrape it with a knife, then soak it in cold, salt-water overnight. Wash the pluck (heart, liver and lights) and put into a pan of boiling water, letting the windpipe hang over the side, and add a teaspoon of salt. Allow it to boil for about 2 hours. Then remove it from the pan, and cut away the windpipe and any superfluous gristle. Take a quarter of the liver and mince it along with the heart and lights. To these add about ½ lb. chopped suet and two parboiled onions, also chopped. Toast two teacups of pinhead oatmeal in the oven until golden and nutty, and add to the rest of the mixture. Season the mixture well with salt and pepper (haggis is highly seasoned and some cooks add a pinch of powdered mace or clovers, although I don’t care for this). Then moisten with about 1 pint of pluck or onion boilings. Drain and dry the bag, and fill it three-quarters full with the mixture. Room must be allowed for the oatmeal to swell, otherwise the bag will burst. Sew the bag with a trussing needle and coarse thread or very fine string. Prick he bag here and there with a needle and plunge the haggis into a pan with enough boiling water to cover. Place an old plate under the haggis, put on the lid and allow it to boil slowly for 2 or 3 hours according to size, keeping the haggis constantly covered with water. When cooked, remove from the pan and place on a hot plate. Remove the threads and slit open the bag. Serve steaming hot, accompanied by hot mashed potatoes and hot mashed swedes (chappit tatties and bashed neeps). Haggis will keep for some time after it has been cooked. It can be reheated when required by putting it in a saucepan of boiling water and allowing it to boil for at least an hour.